Catherine Holman Folk Art: Cupcake Print Giveaway! 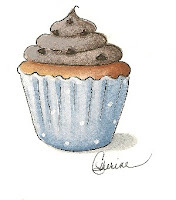 Name that cupcake painting! Cupcake Print Giveaway! Name that cupcake painting! Did I hear someone ask what's on my art table today? 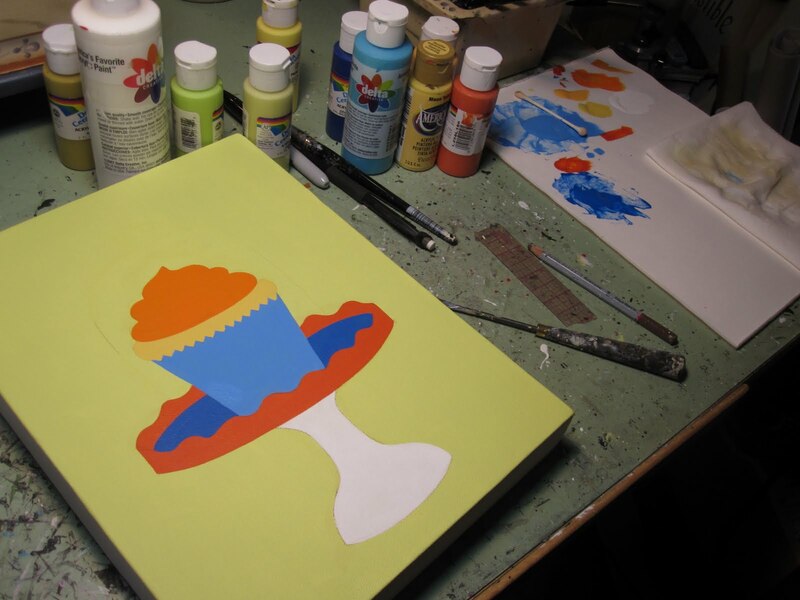 Below is the cupcake painting I'm currently working on. The colors may look like a design disaster, but I'm pretty calm that all will turn out well. I will share the finished piece on my next blog post and will let you know when the painting will be listed on eBay. Just for fun though, I thought I'd have you leave your comments letting me know what you think the title of this little painting will be. I've already got the name in my head and I'm going to give away a free print of this design to the lucky winner. Keep in mind that's a free PRINT, not a free painting. If more than one person guesses the correct name of this painting, I will have a drawing to choose the winner. You will have until Sunday at midnight April 30th to leave me your answer. You must leave your answer in the comments here and not on Facebook. Facebook has rules about giveaways that I didn't realize. You can guess as many times as you wish through the 30th. If no one gets the correct answer, I will put all the names in a pot and draw a winner. If you share my giveaway on your blog (along with a link for the giveaway) you get another chance if you come back here leaving another comment telling me. 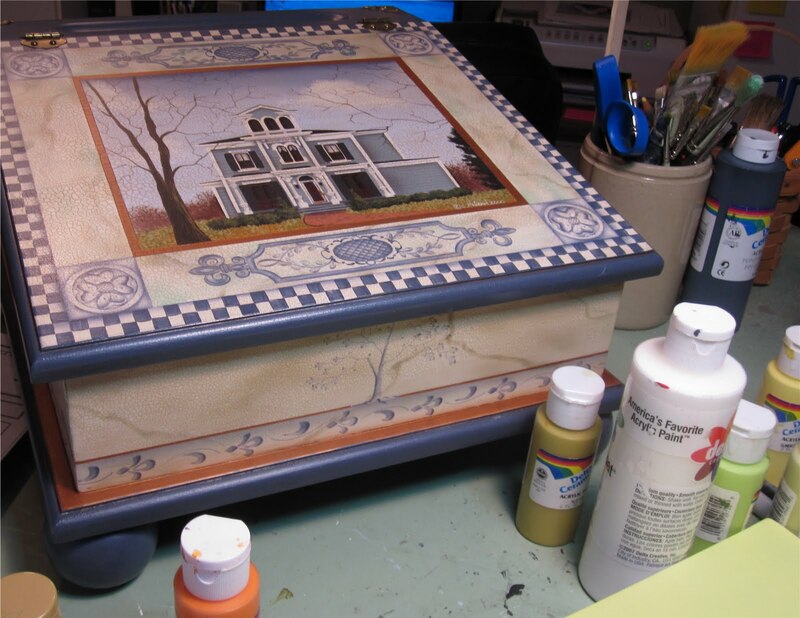 This lap desk is also on my paint table waiting for touch ups. I've decided to let some of my older pieces go and will let you know when these items are for sell too. Name that cupcake! You could be a winner! Click on the "comments" link below. You always have the greatest names for your cupcakes. The only one I could think of off the top of my head was: Ring-Around-the-Cupcake. Also, I put your giveaway on the sidebar of My Blog. is it a "Happy Mothers day" cupcake? juicy orange maybe? or all about orange? Spring Smiles Cupcake . . .
Hmmm, maybe "Orange Blossom"? I know it's going to be lovely...all your cupcakes are. Can't wait to see the final painting and the name! "Circus Delight" is what comes to mind. The colors remind me of the circus, so I am guessing "Circus Delight". Can't wait to see the finished artwork. How fun!! I can only guess..
"The Cupcake of My Eye"
Ok - The other thing the colors remind me of would be the animal crackers - which have that circus theme going on again. So "Animal Crackers" is my second guess. How about Orange Cream Cupcake? Okay, seriously...I do have a life but I had to write one more. Have a Cherry Mother's Day! Ok I have a question---- is it a one word or two word title? I'm wondering if I lost a comment. I could swear I wrote another one...but I didn't save them so I'm not sure. Ah well, you've received a fair share from me. Haha. peachy keen or just peachy? Orange cherry Springtime delight cupcake..